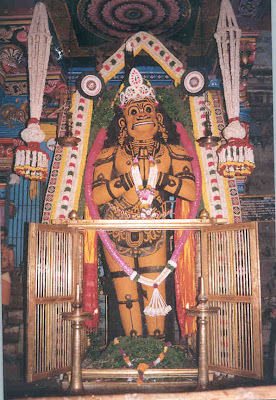 There is a huge 18 feet idol of Lord Hanuman on your right, as soon as you enter the temple. There are musical pillars, cut out of a single rock. 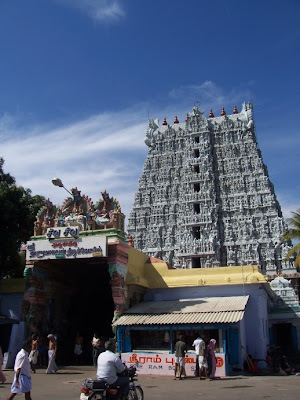 Suchindram Temple is situated at a distance of 13 km northwest from Kanya-kumari. It is believed that Lord Siva stayed at this place when Devi came for self-punishment at Kanyakumari. 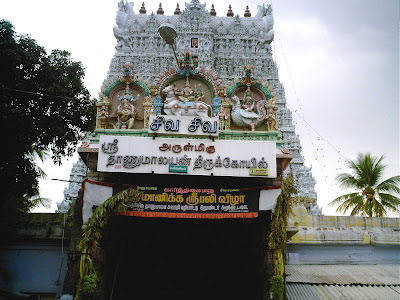 Suchindram Temple has a large white coloured entrance known as `gopuram`, which is 40 meter in height. 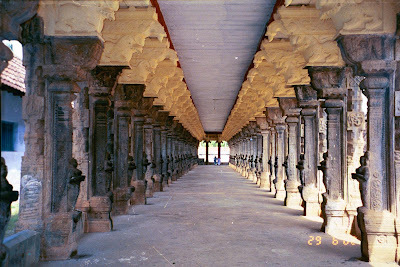 This notable temple of Tamil Nadu has long pillared halls. The stories from the great epics Ramayana and Mahabharata are depicted in the walls of the temple. The temple is a seven-storied construction. There is a story behind the name of the temple `Suchindram`. 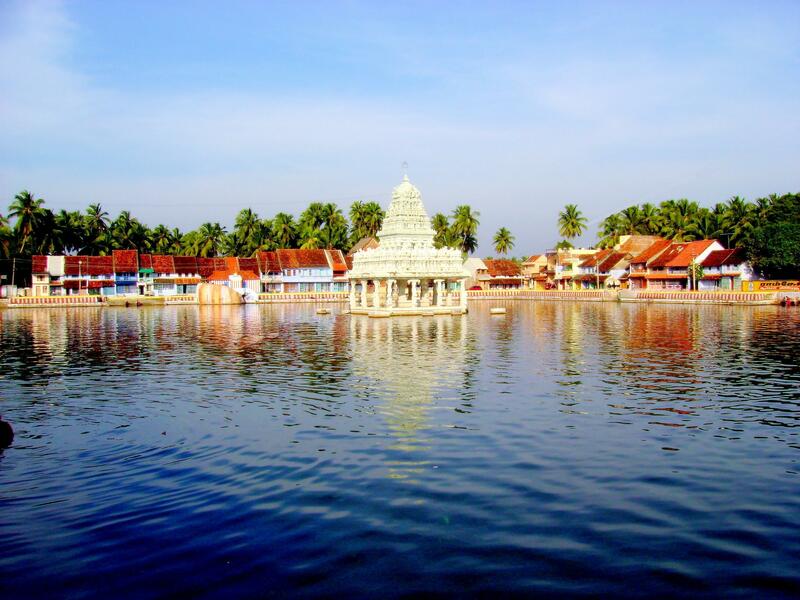 It is said according to `sthalapuram` that it was the place which purified Indra and hence the name `Suchindram` because the term purification in Sanskrit means `Suchi`. There is a belief that Indra is yet performing Ardhajama Puja. The only place dedicated to the Trinity is the shrine, which is known as `Thanumalaya`. The name Thanumalaya` is derived from the combination of the Trimurtis. `Thanu` is a synonym for Siva, `Mai` for Vishnu and `Ayan` for Brahma. According to an ancient belief, the top, middle and base of the linga in the temple represent Siva, Vishnu and Brahma respectively. This `sthala` is also linked to the tradition of proof of chastity given by Devi Anasuya. This temple is counted among the few temples in the country where the Trinities are worshipped. The temple`s musical pillars and an excellent statue of the Hanuman are the main attraction. Apart from this, there is a valuable collection of art from different periods can also be seen. The brilliant workmanship of the temple in stone is noteworthy. Many ancient sculptures like Vigneshvari, the female form of Vinayaka and the scene of the Geethopadesa (Krishna to Arjuna) are also noticeable, which cannot be seen anywhere in India. The sculptures are carved exquisitely out of a single block of granite. The imposing figure of `Anjancya` is an 18 feet high structure, which is a product of marvellous sculptural skill. There is a gigantic image of Nandi can also be seen in the temple, which is locally known as `Makkalai`. It is made of chank powder and is considered as the biggest in India. On the side of the long hall after the entrance, 1108 sculptured women stand, holding oil containers. A huge boulder halfway downs the hall, and just outside to the right contains the temple records, inscribed in Tamil and Sanskrit. Again, at the end of the next hall, there is a small shrine, which is dedicated to Rama and Sita, the heroes of the Ramayana. The time of construction of this building is not clear. But according to the most faithful sources, much of the temple was constructed from the 17th to 18th centuries. An annual 10-day chariot festival is celebrated in the temple to commemorate the three deities Brahma, Vishnu and Siva. Their images, each in their own chariots, are taken in procession. The festivals during Chitirai and Margazhi are celebrated in a grand way.